Much like Monty Python’s Spanish Inquisition, nobody was expecting the European Elections – at least not in Britain this May, writes Sunder Katwala. The extension of Article 50 means that the British government is now asking voters to elect British MEPS to sit in the 2019-24 European parliament, in an election which will take place 35 months after a majority voted to leave the European Union on June 23rd 2016. There are few clearer symbols of how the Brexit process has not gone to plan. These would be the most unusual and hard to predict elections ever held in Britain. The Prime Minister will today say they can still be prevented by an outbreak of consensus on her deal, but the chances of such a breakthrough within days are becoming vanishingly small. There are many rival predictions about what might happen – but nobody can know for sure which will be proved right. Will there be an unusually high level of participation – or a widespread boycott by voters who think the whole idea is a daft waste of time and money? An angry surge which sees Nigel Farage’s Brexit party sweep to a clear win, a breakthrough for parties further to the right, or a counter-mobilisation of pro-Remain voters, hoping to turn Brexit delayed into Brexit denied, with higher motivation to participate now on the pro-EU side of the argument? Each of these dynamics may feature or combine to some extent. It may be unwise to rule out the usual apathetic response, common across both European and local elections, where a third of us vote and most people don’t bother, even in unusual times. Yet the highest European Elections turnout ever would not be difficult to achieve – mainly because that bar is pretty low. Turnout was 36% last time around. The rather modest all-time record, across eight contests, is the peak of 38.5% in 2004, with turnout having been a miserable 24% in 1999. The one thing the European Elections can’t really do is to prove which side would win any future referendum, even if they feel very much like a trial run – or perhaps a pre-season ‘unfriendly’ for campaigners on both sides. The European Elections are a very poor proxy for a future referendum – because the voters who decided the last referendum, and who could tip the next one, are unlikely to take part, while hundreds of thousands of people ineligible to participate in a referendum will vote in the European Elections. There were 16.5 million votes in the last European Elections compared to 31 million in the 2015 General Election that followed. But 34 million then voted in the 2016 referendum. That additional surge of 3 million unusual voters flipped the outcome, from a knife-edge 51% Remain preference among General Election voters to the 52% Leave majority among those who turned up in 2016. Some of those voters were casting their first vote for twenty years – but many did not return to the polls for the 2017 General Election. Meanwhile, research by John Curtice has found that those who stayed at home in the 2016 referendum would have opted mainly for Remain if they had voted. Some of the 2016 non-voters did take part in the 2017 General Election: a higher proportion say they would vote if there was another referendum. Where Remain now has a narrow lead in opinion polls, “differential turnout” – who intends to vote or not – has been more important than the rarer phenomena of people changing their minds. Getting Remain-leaning non-voters to the polls could be decisive in a future referendum – but these irregular and unusual voters are much less likely to take part in the European elections first. This could be a very polarising contest – partly because the stakes are lower. There is not the pressure that both sides face in a referendum to appeal to 50% of people. Large parties may be trying to secure at least a quarter of the vote, and smaller ones to strike a chord with 10-15% of people to get some MEPs elected. There is more pressure to appeal to a party’s core vote than to reach out – so this could have some significant impacts on the internal politics of how both the Conservatives and Labour approach Brexit during the campaign, and beyond it. EU nationals are eligible to vote in the European elections. Just over 50% were registered in 2014, though there are no recorded turnout figures. Influencing who sits as MEPs could help campaigns like The 3 Million as they seek the ring-fencing of citizens’ rights in a No Deal scenario, supported at Westminster through the Costa Amendment – but it is another way in which this vote will be different from any future referendum. There are calls to change the general election/referendum franchise to include those who could not vote in 2016, but these seem unlikely to prevail. Most pro-Remain politicians and campaign groups believe that legitimacy would depend on reversing the result without changing the franchise in this way. If the European Election campaign would be a poor guide to a future referendum, it may be even less of a guide to how the parties would do in a General Election. 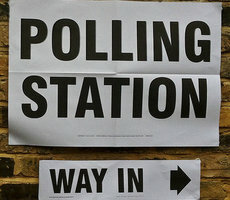 Even without the unique circumstances of a Brexit delay, the European Elections in Britain have mostly been “outsider elections” with voters making very different choices than when they are electing a government. So votes fragment much more in European Elections. No party has won a third of the vote since William Hague topped the European polls in 1999, on his way to a landslide defeat in 2001. Governments do terribly in European Elections: David Cameron’s 24% in 2014 looks positively healthy compared to the 15% polled by Gordon Brown’s Labour Party in 2009, a result which sparked an abortive coup in an unhappy party with a deeply divided Cabinet. At each of the last three European Elections, the main party of government happens to have polled 13% below their vote at the next General Election; a benchmark which suggests that 25% is a ‘par’ score benchmark for a governing party. The Labour Party has not won the European Elections for 15 years, last topping the poll in 2004. The two major parties together have scored under half of the votes in the last three European Elections. A proportional representation electoral system, a system of regional party lists and a sense among voters that these are low stakes elections which offer a chance to cast a ‘protest vote’ makes these ideal opportunities for new and outsider parties – from the Greens winning 15% in 1989 to UKIP topping the poll in 2014. The structure of the elections – in which parties run regional lists of candidates and the contest takes place more in the media than on the doorstep – makes it easier for brand new parties to make a mark. Nigel Farage will hope that happens for his Brexit party, while ‘Change UK’, formerly TIG, will look for a strong showing in their first electoral test. The elections are a political contest. The political parties need to explain their approach to Brexit, the EU and other issues. They also present challenges for those outside party politics, whose concern is about the impact on community tensions, both at a national and a local level. Civic society actors, with little time to prepare, need to pursue a strategy of vigilance without alarmism – and to work out where there are approaches or interventions that can be practically useful. Mainstream politicians have been warning of an extremist breakthrough, often to strengthen their political arguments against holding the elections. Several MPs have warned that Tommy Robinson will end up in the European Parliament, having become a close associate and personal adviser of UKIP leader Gerard Batten. Batten has said that Robinson cannot be selected as a candidate, as he is not eligible to join UKIP as a former BNP member. Robinson, who sponsored UKIP’s Westminster rally against Brexit, may still be a prominent campaigner for the party. UKIP has recruited other controversial ‘alt right’ figures, though they are better known on the internet than in the real world. The direct use of Facebook advertising by parties may mean that several run messages aimed at their core support, which are very different from their voice in the national media. The proportional electoral system allows smaller parties – whether they are the Greens or the far right – to gain representation by gaining above 5% of the vote in a region, though it can take a share of over 10% to win a seat in regions with fewer seats. The BNP won seats in 2009, before losing them in 2014. Many former UKIP members – who disapprove of the link with Tommy Robinson – have joined the new Brexit Party, led by Nigel Farage. Given that he and UKIP were synonymous for many years, one challenge for Farage is that his supporters may still associate him with his former party. He may need to step up his challenge to UKIP being “the new BNP” to ensure the message has got across. Farage himself was called out by the Sun newspaper during the 2014 campaign: its Sun Says lead editorial arguing that, while it is not racist to debate immigration, his comments ‘smearing Romanians for being Romanian’ were racist. Extremism and polarisation are often conflated. This unanticipated election is likely to increase polarisation on all sides about Brexit. Those most invested in the issue will see it as a very high stakes occasion, even if a large section of the broader public is considerably more indifferent. Political anger – switching votes or vowing never to back a party again – can have its place in democratic politics. Threats of violence should not. A tone of political civility towards opponents is valuable, but cannot be mandatory. Some boundaries, however, do matter. The escalation of language of “traitors” can heighten the atmosphere in which those unable to make the distinction between democratic argument and calls to violence may feel triggered to act. The most useful practical way to counter the threat of extremist fringe parties trying to win representation is to encourage more of the broad majority, who do not hold extremist views, to take part and to vote for whomever they choose. In previous European Elections, young people and ethnic minority voters have been considerably less likely than other voters to take part. The value of taking part, and having your vote counted, can be promoted without supporting any candidate or party, by public voices with a civic purpose but no partisan views. Organisations both small and large can make a practical difference in this way. Civic actors need to be vigilant without being alarmist. Challenges to extremism and prejudice are important. One challenge for non-partisan actors in maintaining important norms and boundaries is how to do so in ways that can reach the audiences they need to – and which might help to reduce a heightened temperature, rather than to increase the heat on all sides. While the national elections take place on regional lists, there could turn out to be specific regional or local flashpoints – should an especially notorious candidate be placed top of a party list, or an extreme party target specific areas and become a focal point for counter-protests and the national media. There will be limited time to ensure that local voices seeking to calm tensions have the support that they need. These may be unusual and unexpected elections in which all rival views about what should happen on Brexit will be put with passion. We should expect all participants to uphold democratic norms – to campaign for their views strongly, while respecting their opponents voice too. Prejudice, extremism and threats of violence have no place in that democratic debate.